Bovril Squeezy Beef and Yeast Extract 200g gives you the powerful meaty kick you're looking for. Drink it, spread it, cook with it! Bovril Beef is really versatile. Quick and easy to prepare, just add a tablespoon to a mug of boiling water for a beefy drink?or flavoursome stock. Bovril's powerful meaty flavour has been keeping Britain's chin up since 1886. The powerful beefy taste of Bovril boosts all your family favourites. High in protein.Bovril Squeezy Beef 200g is the original Beef hot drink that has been keeping Britain?s Chin up since 1886. Just add one good teaspoonful to a mug of hot water for a delicious Beef hot drink. Great for warming you up in the great outdoors, at the football, or on those cold winter nights. Whatever the situation a warm mug of Bovril will get you through. Bovril Beef Stock Paste is great for a really meaty Beef Stock. High in protein it?s a great way to give a beefy boost to all your British classics, whether it?s a meaty pie, beefy gravy or a great tasting casserole you?re after. Have you tried it as a beefy boost to your Burger? Spread Bovril Beef on crumpets, toast, crackers or in your sandwiches for a real beefy snack. 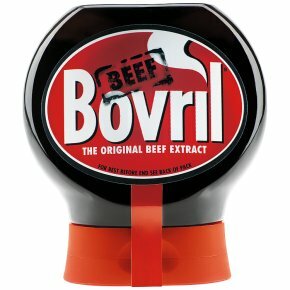 Bovril?s hearty beef paste makes a great beefy treat, either as a drink or spread. Add Bovril Beef to a mug of hot water and enjoy as a hearty drink, spread on toast for a beefy breakfast treat, beef up your sandwiches or use it as a rich, beef stock for your favourite British dishes. We also have a range of delicious stock paste and cubes, including 125g Beef Stock Paste, 250g Beef Stock Paste, 500g Beef Stock Paste, 125g Chicken Stock Paste and our Beef Stock Cubes. Great for giving your dishes a meaty flavour kick. British to the backbone Bovril has been keeping Britain?s Chin up since 1886! Do you know your Bovril history? In 1871, a Scot named John Lawson Johnston won a 'canned beef' contract to feed Napoleon's troops with his invention "Johnston's Fluid Beef", the original name for his famous Beef Extract. Renamed Bovril in 1886, the Great British drink we know and love was born. On Christmas Day in 1902, Captain Scott and Ernest Shackleton supped on a warming cup of Bovril after a chilling four-hour march across the South Pole. In 1968, the year Bovril production moved from London to Burton on Trent, Burton Football Club was saved from relegation when Stevenage Town left the Southern League! In 1994, enough Bovril drink was made to fill 90 million match day mugs! Simply add one good teaspoonful to a mug of hot water and enjoy.